A common belief is that “Georgia” , the western name for our country, is named after Saint George. There is significant conjecture amongst historians on this point however, One school of thought is that the ancient Greeks referred to Colchis and Iberia as “The Land of Farmers”, having witnessed relatively well organised agricultural activity here when they engaged in trade and establishment of their colonies on the Black Sea coast, and developed the name Georgia from the Greek word georgos (γεωργός) . Other writers suggest the word is of Persian origin, which is possible given that much of Georgia has been under Persian influence culturally and linguistically for 2500 years. Regardless of the origin of the name, there is no dispute that Saint George has a special place in the hearts of Georgian people. Having originated in Cappadocia in Anatolia, it is believed that he was the cousin of Saint Nino, the Enlightener of the Georgians, and we are already familiar with the great reverence in which she is held. Tradition holds that Saint Nino taught the people of Iberia about the many martyrs of the persecutions of Diocletian, including her cousin Saint George. This account expands upon our previous post on Saint George, which focussed upon his tortures on the wheel prior to his martyrdom. The Holy GreatMartyr George the Victory-Bearer, was a native of Cappadocia (a district in Asia Minor), and he grew up in a deeply believing Christian family. His father had accepted a martyr’s death for Christ, when George was yet a child. His mother, owning lands in Palestine, resettled there with her son and raised him in strict piety. Having grown up, Saint George entered into the service of the Roman army. He was handsome, brave and valiant in battle, and he came to the notice of the emperor Diocletian (284-305) and was accepted into the imperial guards with the rank-title of “comites” – one of the higher military officer ranks. The pagan emperor, while having done much for the restoration of Roman might, and who was quite clearly concerned, as to what sort of danger the triumphing of the Crucified Saviour might present for pagan civilisation, in especially the final years of his reign intensified his persecution against the Christians. Upon the advice of the Senate at Nicomedia, Diocletian afforded all his governors full freedom in their court proceedings over Christians and in this he promised them all possible help. Saint George, having learned about the decision of the emperor, distributed to the poor all his wealth, set free his servants, and then appeared in the Senate. The brave soldier of Christ spoke out openly against the emperor’s designs, he confessed himself a Christian and appealed to all to acknowledge the true faith in Christ: “I am a servant of Christ, my God, and trusting on Him, I have come amidst ye at mine own will, to witness concerning the Truth”. “What is Truth?” – one of the dignitaries said, in repeating the question of Pontius Pilate. “Truth is Christ Himself, persecuted by ye”, – answered the saint. Stunned by the bold speech of the valiant warrior, the emperor – who loved and had promoted George, attempted to persuade him not to throw away his youth and glory and honours, but rather in the Roman custom to offer sacrifice to the gods. To this followed the resolute reply of the confessor: “Nothing in this inconstant life can weaken my resolve to serve God”. Then by order of the enraged emperor the armed-guards began to jostle Saint George out of the assembly hall with their spears, and they then led him off to prison. But the deadly steel became soft and it bent, just as the spears would touch the body of the saint, and it caused him no hurt. In prison they put the feet of the martyr in stocks and placed an heavy stone on his chest. The next day at the interrogation, powerless but firm of spirit, Saint George again answered the emperor: “Thou wilt become exhausted sooner, tormenting me, than I being tormented of thee”. Then Diocletian gave orders to subject Saint George to some very intense tortures. They tied the GreatMartyr to a wheel, beneathe which were set up boards inset with sharp pieces of iron. With the turning of the wheel the sharp edges tore at the bared body of the saint. At first the sufferer loudly cried out to the Lord, but soon he quieted, not letting out even a single groan. Diocletian decided that the tortured one was already dead, and he gave orders to remove the battered body from the wheel, and set off then to a pagan temple to offer a thank-offering. But at this very moment it got dark all over, thunder boomed, and a voice was heard: “Fear not, George, for I am with thee”. Then a wondrous light shone, and at the wheel appeared an Angel of the Lord in the form of a radiant youth. 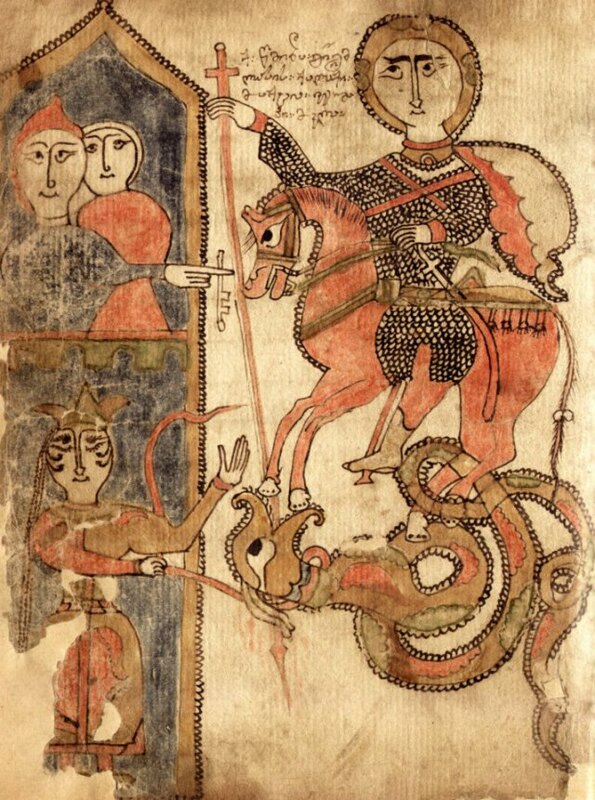 And just as he lay his hand upon the martyr, saying to him: “Rejoice!” ‑- Saint George stood up healed. And when the soldiers led him off to the pagan temple, where the emperor was, the emperor could not believe his own eyes and he thought, that in front of him was some other man or even a ghost. In confusion and in terror the pagans looked Saint George over carefully, and they became convinced, that actually a miracle had occurred. Many thereupon came to believe in the Life-Creating God of the Christians. Two illustrious officials, Saints Anatolios and Protoleon, – secretly Christians, therewith openly confessed Christ. And right away, without a trial, by order of the emperor they were beheaded with the sword. Present also in the pagan temple was the Empress Alexandra, the wife of Diocletian, and she too knew the truth. She was on the point of glorifying Christ, but one of the servants of the emperor took her and led her off to the palace. The emperor became all the more furious. But not having lost all hope of swaying Saint George, he gave him over to new quite fiercesome torments. Having thrown him down a deep pit, they covered it over with lime. Three days later they dug him out, but found him cheerful and unharmed. They shod the saint in iron sandals with red-hot nails, and with blows they drove him back to the prison. In the morning, when they led him back to the interrogation, cheerful and with healthy feet, he said to the emperor, that the sandals had fit him. Then they beat him with ox-thongs so much, that his body and blood became mingled with the ground, but the brave sufferer, strengthened by the power of God, remained unyielding. Having decided, that magic was helping the saint, the emperor summoned the sorcerer Athanasias, so that he should try to deprive the saint of his miraculous powers, or else poison him. The sorcerer gave Saint George two goblets with drugged ingredients, the one of which should have quieted him, and the other – to kill him. But the drugs also did not work – and the saint as before continued to denounce the pagan superstitions and glorify the True God. To the question of the emperor, what sort of power it was that helped the saint, Saint George answered: “Think not, that the torments do me no harm thanks to human powers, – I am saved only by calling upon Christ and His Power. Whoso believeth on Him hath no regard for tortures and is able to do the deeds, that Christ did” (Jn. 14: 12). Diocletian asked, what sort of deeds were they that Christ did. – “To give sight to the blind, to cleanse the leprous, to grant walking to the lame, and to the deaf – hearing, to cast out devils, and to raise up the dead”. Knowing, that never whether by sorcery, nor by any of the gods known to him, never had they been able to resurrect the dead, and wanting to test the trust of the saint the emperor commanded him to raise up a dead person right in front of his eyes. To this the saint replied: “Thou wouldst tempt me, but for the salvation of the people which shalt see the deed of Christ, my God wilt work this sign”. And when they led Saint George down to the graveyard, he cried out: “O Lord! Show to those here present, that Thou art the One-Only God throughout all the world, let them know Thee as the Almighty Lord”. And the earth did quake, a grave opened up, the dead one came alive and emerged from it. Having seen with their own eyes the Almighty Power of Christ, the people wept and glorified the True God. The sorcerer Athanasias, falling down at the feet of Saint George, confessed Christ as the All-Powerful God and besought forgiveness of his sins, committed in ignorance. The obdurate emperor in his impiety thought otherwise: in a rage he commanded to be beheaded both the new-believer Athanasias and likewise the man resuscitated from the dead, and he had Saint George again locked up in prison. The people, weighed down with their infirmities, began in various ways to penetrate the prison and they there received healings and help from the saint. There resorted to him also a certain farmer named Glycerios, whose ox had collapsed. The saint with a smile consoled him and assured him, that God would restore his ox to life. Seeing at home the ox alive, the farmer began to glorify the God of the Christians throughout all the city. By order of the emperor, Saint Glycerios was arrested and beheaded. The exploits and the miracles of the GreatMartyr George had increased the number of the Christians, and therefore Diocletian decided to make a final attempt to compel the saint to offer sacrifice to the idols. They began to set up a court at the pagan temple of Apollo. On the final night the holy martyr prayed fervently, and when he dozed off, he beheld the Lord Himself, Who raised him up with His hand, and hugged him in giving him a kiss of greeting. The Saviour placed on the head of the GreatMartyr a crown and said: “Fear not, but rather make bold and be vouchsafed My Kingdom”. In the morning at the court the emperor offered Saint George a new test – he proposed to him to become his co-emperor. The holy martyr with a feigned willingness answered, that from the very beginning the emperor had seemed inclined not to torture him but rather shew mete mercy, and with this he expressed the wish to go forthwith into the pagan temple of Apollo. Diocletian decided, that the martyr was accepting his offer, and he followed after him into the pagan temple with his accompanying retinue and the people. Everyone waited, whether Saint George would offer sacrifice to the gods. He however, in going up to the idol, made the sign of the Cross and turned towards it, as though it were alive: “Thou wishest to receive from me sacrifice befitting God?” The demon inhabiting the idol cried out: “I am not God and none of those like me are God. The One-Only God is He Whom thou preachest. We are of those servant-angels of His, which became apostate, and in the grips of jealousy we do tempt people”. “How dare ye to be here, when hither have come I, the servant of the True God?” – asked the saint. Then was heard a crash and wailing, and the idols fell down and were shattered. There began a general confusion. In a frenzy pagan-priests and many of the throng pounced upon the holy martyr, they tied him up and began to beat him and demand his immediate execution. Into the noise and the shouts rushed the holy empress Alexandra. Pushing her way through the crowd, she cried out: “Thou God of George, help me, in as Thou Alone art All-Powerful”. At the feet of the GreatMartyr the holy empress glorified Christ, Who had humiliated the idols and those worshipping them. Diocletian in a rage immediately pronounced the death sentence against the GreatMartyr George and the holy Empress Alexandra, who without being accompanied, followed Saint George to execution. Along the way she collapsed and slumped senseless against a wall. Everyone thought, that the empress was dead. Saint George offered up thanks to God and he prayed, that he should end his path worthily. At the place of execution the saint in heated prayer besought the Lord, that He would forgive the torturers that knew not what they did, and that He would lead them to the knowledge of Truth. Calmly and bravely, the holy GreatMartyr George bent his neck beneathe the sword. This occurred on 23 April 303. In confusion the executioners and the judges catch glimpse of their Conqueror. In a bloody agony and mindless thrashing about ended the era of paganism. It lasted for all of ten years more – up until the time of the holy Equal-to-the-Apostles Constantine, who was one of the successors to Diocletian upon the Roman throne, and who gave orders to imprint the Cross on his military-banners, as a testament also sealed by the blood of the GreatMartyr George and that of the blood of thousands of unknown martyrs: “By this sign thou wilt conquer”. Of the many miracles, worked by the holy GreatMartyr George, the most famous are depicted in iconography. In the native-region of the saint, at the city of Beirut, were many idol-worshippers. Outside the city, near Mount Lebanon, was situated a large lake, in which lived an enormous dragon-like serpent. Coming out of the lake, it devoured people, and there was nothing the people could do, since from one of its nostrils it infected the very air. On the advice of the demons inhabiting the idols, the ruler there adopted this decision: each day the people would draw lots to give over as food their own children, and when the turn reached him, he promised to hand over his only daughter. That time indeed did come, and the ruler, having dressed her in her finest attire, sent her off to the lake. The girl wailed bitterly, awaiting the moment of death. Unexpectedly for her, the GreatMartyr George rode up on his horse and with spear in hand. The girl implored him not to leave her, lest she perish. But the saint, having caught sight of the serpent, signed himself with the Sign of the Cross and with the words “In the Name of the Father and of the Son and of the Holy Spirit”, he rushed off after it. The GreatMartyr George pierced the throat of the serpent with his spear and trampled it with his horse. Then he bid the girl bind the serpent with her sash, and like a dog, lead it into the city. The people fled in terror, but the saint halted them with the words: “Be not afraid, but rather trust on the Lord Jesus Christ and believe in Him, since it be He Who hath sent me to you, to save you”. Then the saint killed the serpent with a sword, and the people burned it outside the city. Twenty-five thousand men, not counting women and children, were then baptised, and there was later built a church in the name of the MostHoly Mother of God and the GreatMartyr George. Saint George went on to become a talented military officer and to amaze the world by his military exploits. He died, when he was not even 30 years old. Hastening to unite with the Heavenly army, he entered into the history of the Church as the Victory-Bearer. Today we commemorate many of the victims of Tamerlane‘s rampage through the Caucasus. 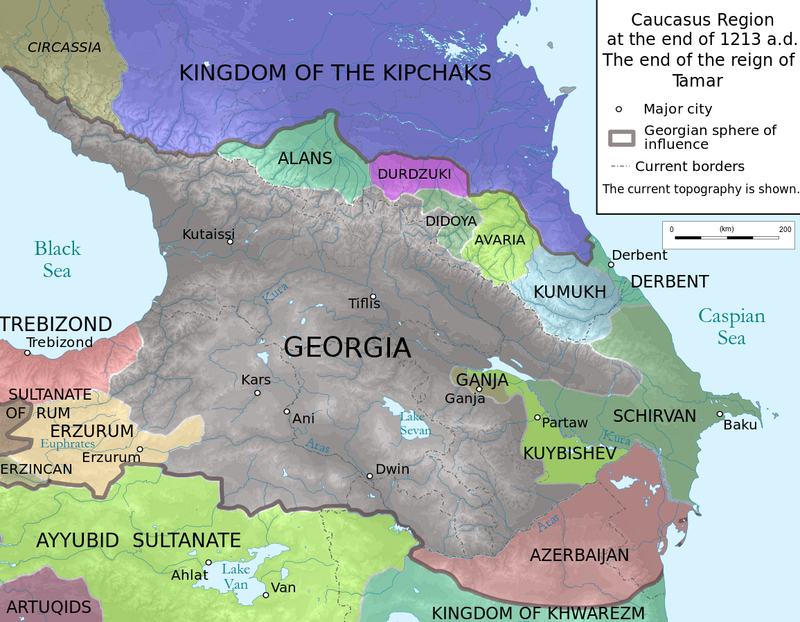 The long-term effects of his invasions, of which there were eight, were that Georgia’s economy was devastated, its political structures splintered, and it never recovered the glories of its Golden Age, as a united country covering much of the South Caucasus. At its peak, Georgia occupied much of present-day Armenia, Azerbaijan, and parts of today’s northeastern Turkey. A more comprehensive history of Timur’s invasions of Georgia can be read here. The shattered Georgian kingdom eventually fragmented into the three kingdoms of Imereti, Kartli and Kakheti, and the principalities of Samegrelo, Guria, Svaneti, Abkhazia and Samtskhe, until their eventual incorporation into the Russian Empire. In the 14th century, during the reign of King Bagrat V (1360–1394), Timur (Tamerlane) invaded Georgia seven times. His troops inflicted irreparable damage on the country, seizing centuries-old treasures and razing ancient churches and monasteries. Timur’s armies ravaged Kartli, then took the king, queen, and the entire royal court captive and sent them to Karabakh (in present-day Azerbaijan). Later Timur attempted to entice King Bagrat to renounce the Christian Faith in exchange for permission to return to the throne and for the release of the other Georgian prisoners. For some time Timur was unable to subjugate King Bagrat, but in the end, being powerless and isolated from his kinsmen, the king began to falter. He devised a sly scheme: to confess Islam before the enemy, but to remain a Christian at heart. Satisfied with King Bagrat’s decision to “convert to Islam,” Timur permitted the king to return to the throne of Kartli. At the request of King Bagrat, Timur sent twelve thousand troops with him to complete Georgia’s forcible conversion to Islam. When they were approaching the village of Khunani in southeastern Georgia, Bagrat secretly informed his son Giorgi of everything that had happened and called upon him and his army to massacre the invaders. The news of Bagrat’s betrayal and the ruin of his army infuriated Timur, and he called for immediate revenge. At their leader’s command, his followers destroyed everything in their path, set fire to cities and villages, devastated churches, and thus forced their way through to Kvabtakhevi Monastery. Monastics and laymen alike were gathered in Kvabtakhevi when the enemy came thundering in. Having forced open the gate, the attackers burst into the monastery, then plundered and seized all its treasures. They captured the young and strong, carrying them away. The old and infirm were put to the sword. As the greatest humiliation, they mocked the clergy and monastics by strapping them with sleigh bells and jumping and dancing around them. Already drunk on the blood they had shed, the barbarians posed an ultimatum to those who remained: to renounce Christ and live or to be driven into the church and burned alive. The executioners hauled in more and more wood, until the flames enveloping the church blazed as high as the heavens and the echo of crackling timber resounded through the mountains. Ensnared in a ring of fire, the blissful martyrs chanted psalms as they gave up their spirits to the Lord. The massacre at Kvabtakhevi took place in 1386. The imprints of the martyrs’ charred bodies remain on the floor of the church to this day. Last Sunday was Forgiveness Sunday, the last Sunday before the season of Great Lent. In order to avoid hypocrisy or lingering resentment at a time when we should be focussed upon prayer, Christians are advised to make their peace with those whom they are in dispute, and any tensions between lay people and their spiritual fathers are to be resolved before Great Lent begins. Despite the many difficulties experienced in Georgia currently with a weakening economy and regional tensions, we are fortunate that we can go about our daily lives peacefully and unmolested for the most part. Regrettably this is not the case in many parts of our immediate neighbourhood. Conflict in Eastern Ukraine between people of the same faith and in some cases from the same towns and neighbourhoods is a great tragedy that may take decades to heal. Only a few hundred kilometres away, Islamic State terrorists in recent days have kidnapped several hundred Assyrian Christians in Syria; such actions in the past have generally ended with martyrdom of the captives. Assyrians are a people native to Syria, Iraq, Iran and south-eastern Turkey, whose presence in the region predates the Arab conquest by millennia. Assyrians typically belong to various churches in communion with Rome, or to Oriental Orthodox communities (in communion with the Armenian Apostolic Church, the Coptic Orthodox Church and the Ethiopian Orthodox Church), or to the Church of the East (a Nestorian church). The so-called Syrian Fathers of the Georgian Church were most likely Orthodox monastics from this nationality. The genocide of the Ottoman Empire’s Christians in 1915, resulting in the mass deaths of Greeks, Armenians and Assyrians throughout the empire, resulted in many survivors fleeing to the Russian Empire as refugees. Many of Georgia’s Armenian, Greek and Assyrian people can trace their ancestries to such refugees; this short documentary explains the perambulation of one persecuted Assyrian community from Turkey to Iran to Georgia during the First World War. 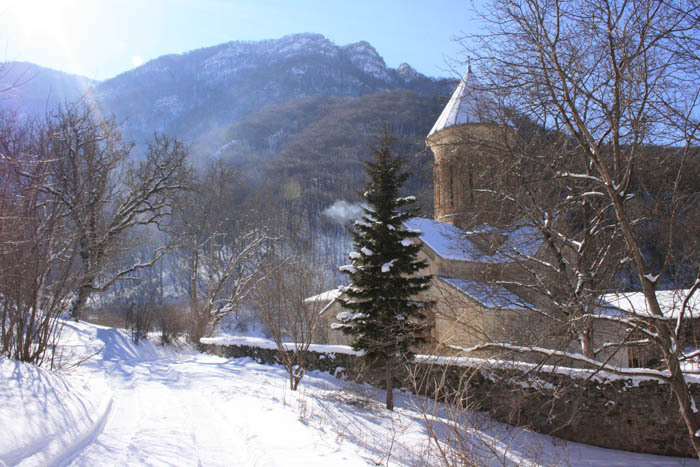 Greek villages in Kvemo Kartli’s Tsalka district and the Assyrian village of Dzveli Kanda in Mtskheta-Mtianeti region are populated with the descendants of such refugees, and Armenian communities in Samtskhe-Javakheti, Kvemo Kartli, Shida Kartli and Tbilisi have many ancestors who fled from Turkey in 1915. With the 100th anniversary of a genocide of the Ottoman Empire’s Christian citizens approaching in late April, tensions are running high between the Turkish government, which claims that no genocide happened or that it was hugely exaggerated, and descendants of the victims, Greek, Armenian and Assyrian, seeking acknowledgement and contrition. No likely agreement is in sight and bitter feelings on both sides are likely to persist for some time; forgiveness is difficult to give if the counterparty expresses no contrition. That being said, sometimes such gestures of contrition are offered at times and places when least expected. This very well written story by an Armenian-American journalist combines interviews with a Kurdish mayor of a small town in southeastern Turkey, trying to make amends for the murders of Armenians that his community’s ancestors committed, and the author’s family history associated with the same small town. 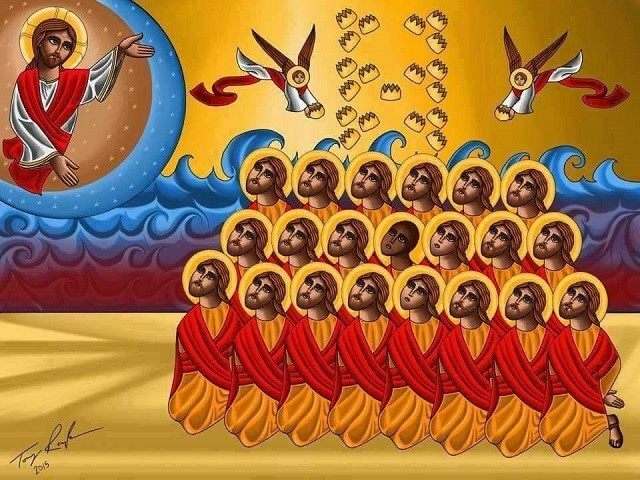 Most of us would have recently seen excerpts of chilling footage of the murder of 21 Coptic Christians on a beach in Libya by Islamic State terrorists. Anger, resentment, hatred and a desire for revenge would be natural emotions for the families of the victims to endure. While no doubt the families would be enduring tremendous grief at losing their loved ones, the brother of two of the victims, speaking on talkback radio in Egypt, amazes all who listen to him by blessing those who killed his brothers and praying for their salvation. While we may be frustrated with day-to-day conflicts and harbour ill-feeling for those we feel treat us with contempt or disrespect, we could all afford to put our concerns into perspective and consider the example of forgiveness and compassion set by the mother of the two Coptic martyrs of Libya. The courage and steadfastness shown by the martyrs should also be an inspiration to us. Yesterday was the Feast of the Ascension, where we relive the Ascension of Christ to heaven and formally end the Paschal season. In Georgia, we concurrently celebrate the forced exile and martyrdom of many thousands of Georgians enslaved by the Iranian Shah Abbas in the 17th century. I have remarked before at the difficult relationship between Iran and Georgia over the centuries. At various times the Christian Church in Persia was very strong, with large numbers of native adherents and a functioning clerical establishment. 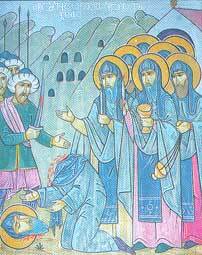 Indeed, Orthodox missionaries from Persia were responsible for evangelising some of the North Caucasus tribes. Unfortunately the conversion of the Persian establishment to Islam resulted in such severe persecution of the Church that in many regions the faith was completely extinguished. Today some of the ethnic Armenian minority in Iran still openly practice their faith within the Armenian Apostolic tradition, but there are few native Christians left and the death sentence for apostasy from Islam is still in place. There is a substantial ethnic Georgian minority in Iran, descended from Kakhetians and Kartlians enslaved by Shah Abbas and deported to Iran. Both the Georgian state and the Georgian Church have been active in reaching out to this diaspora community. Almost all of this community are now Shi’ite Muslims, and the crypto-Christianity practiced by the exiles referred to in this passage appears to have been extinguished over time. There are probably millions of Iranians with some Georgian ancestry, but less than 100,000 identify as being of Georgian ancestry. The Isfahan region of Iran has the densest population of Georgians in Iran, with one small town Fereydunshahr still using a Georgian dialect and Georgian script. It is also interesting that the “Turkmen” referred to in this passage as having replaced deported Kakhetians have given rise to the nominally ethnic Azeri populations of Sagarejo and Shiraki, who still live in the region in large numbers. Throughout history Georgia has frequently been forced to defend what Saint Ilia the Righteous called its “threefold treasure”— language, fatherland, and Faith. In this regard, the events of the 17th century are some of the most tragic in all of Georgian history. In 1616 the bloodthirsty Persian ruler Shah Abbas I invaded Georgia with a massive army. His goal was to level the country completely, to leave not a single building standing. The shah’s army kidnapped hundreds of thousands of Kakhetian Georgians and then sent them to Persia to be sold as slaves. They settled Turkmen in the newly depopulated Georgian regions. In collaboration with the Shah, many Lezgin peoples from the mountainous North Caucasus moved south to occupy the homes of the exiled Georgians. Of language, fatherland, and Faith, only language remains alive among Georgians in the formerly Persian territories. Most have lost touch with both their fatherland and the Christian Faith. Those fortunate enough to be able to return to Georgia often convert to Orthodox Christianity. In 2001, when Catholicos-Patriarch Ilia II visited the ethnic Georgians in Iran, he presented them with a mound of Georgian soil. With great emotion the Georgians scattered the soil over the ground where their ancestors were martyred. On September 18, 2003, the Holy Synod of the Georgian Orthodox Church prayerfully considered the martyric contest of the Georgians in Persia. The Synod declared all those martyred at the hands of Muslims in the 17th and 18th centuries worthy to be numbered among the saints. Their commemoration day was set on the feast of Holy Ascension, in honor of the place where many of them were martyred. As our brothers and sisters from the Orthodox communities of the Greek Diaspora, and our Romanian friends, prepare to celebrate Christmas tonight, and we in Georgia prepare for the Feast of the Nativity on January 7, we should pray for our fellow Christians in Syria who are facing persecution and martyrdom for their faith at the hands of Jihadists. Home to Christian communities from Eastern Orthodox, Oriental Orthodox, Melkite and Assyrian Catholic, Nestorian and Protestant congregations, over 2.5 million Christians face a very uncertain future in the geographic cradle of the Christian faith. The connection between Syria and Georgia is significant, as the Thirteen Assyrian Fathers were very significant evangelists to the Georgians during the Persian occupation of Georgia in the 6th century, and are widely venerated today for their energy in establishing new temples and monastic centres while Georgia was governed by Zoroastrians hostile to the Christian faith. Armenia has been resettling many Syrians of Armenian descent in Yerevan as refugees, but in Georgia most Syrians living here are business migrants rather than refugees. Georgia being well acquainted with the horrors of war and internal displacement of innocent people, it is to be hoped that Immigration officials are not overzealous in excluding Christian families seeking temporary respite here. This press release from the Syriac Orthodox Metropolitan of Homs and Hama, Mor Selwanos Boutros Alnemeh, documents the largest massacre of Christians in the Middle East of the past decade, and the near-destruction of their village. The Syriac Orthodox Church is of the Oriental Orthodox Community, in communion with the Coptic, Ethiopian and Armenian churches. Please keep these people in your prayers as you enjoy your Christmas festivities. I present to you a glimpse of the events which have overtaken Sadad over the weeks since its occupation by armed men and terrorists. 2- It has 14 churches and a monastery with four priests and five halls for social activities and celebrations. 4- They live in the middle of the desert, and it is a harsh, dry climate, where no rain falls..
5- The number of families which immigrated to Sadad from the different villages and provinces, owning to the Syrian crisis, is 600. 6- The terrorists entered Sadad on 21-10-2013 and occupied it for a week. On 28-10-2013 they were driven out and some of them were killed. 7- 2,500 families fled Sadad because of this occupation by the terrorists. They spread out between Damascus, Homs, Fayrouza, Zaydal, Maskane, and al-Fhayle. 8- 1,500 families were held as hostages and human shields for a week, amongst them children, old men, young men, and women. Some of them fled, walking 8 km from Sadad to al-Hafer to find refuge. 9- Some were killed and some were threatened by the bullet, by strangulation, execution and with the destruction of their houses. 45 civilians were martyred including women, children and men. 11-All the homes of Sadad have been robbed, their possessions looted, by all the forces which entered Sadad. The commercial premises shared the same fate. 12- They destroyed the churches and stole some of their possessions, money and ancient books, and graphitized insults against Christianity. All government, school, and council buildings were destroyed, along with the post office, the hospital and clinic, as well as the Finance and the Agricultural Ministry branches. 14- The crisis in Sadad led to the forced migration of some 500 families of al-Hafer, and the looting and destruction of some of their houses. 15- The families of Sadad fled from their town only in the clothes they were wearing, and anyone who brought with him money, gold or documents was robbed of them. 16- Our children have lost their future because of the destruction of the schools, the nursery, and the youth centre. Photographs of the devastation done can be seen here via Devastating Images & Report from the Christian Town of Sadad in Syria – Exclusive – News | Orthodoxy Cognate PAGE.